The city of Hamburg in the northern part of Germany is proud of a world premiere. All-electric buses from different manufacturers can recently charge their battery with one charging station produced by Siemens AG, the largest engineering company in Europe. Additionally, three new battery-powered buses built by Solaris will begin their operation. 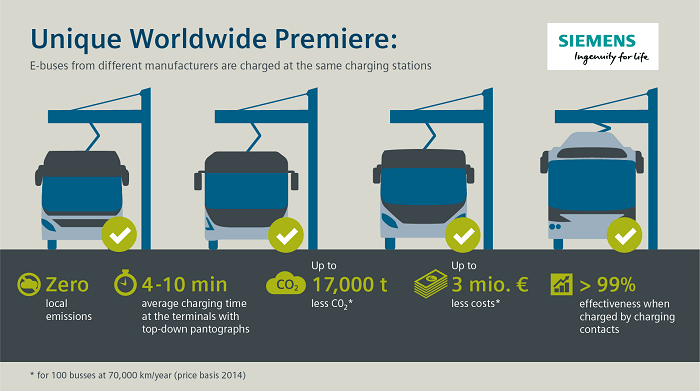 They can be charged at the new Siemens’ charging station as well as the existing plug-in hybrid buses from Volvo. Environment-friendly urban mass transit with electric motors is a further component to improve the air quality in cities. Ideally, nothing should stand in the way of these ambitions. 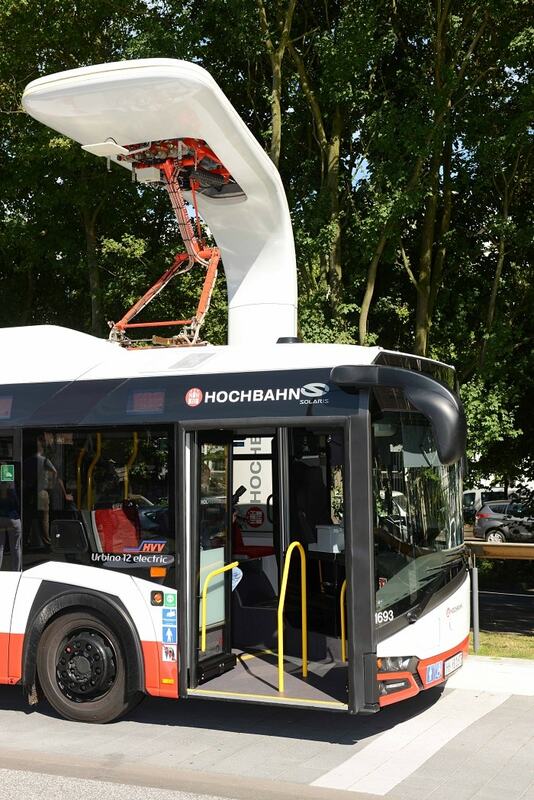 A charging station which is only able to charge certain types of buses would restrict the freedom of action of the operating transport company Hamburger Hochbahn AG. Hamburg’s new charging technology ensures interoperability. 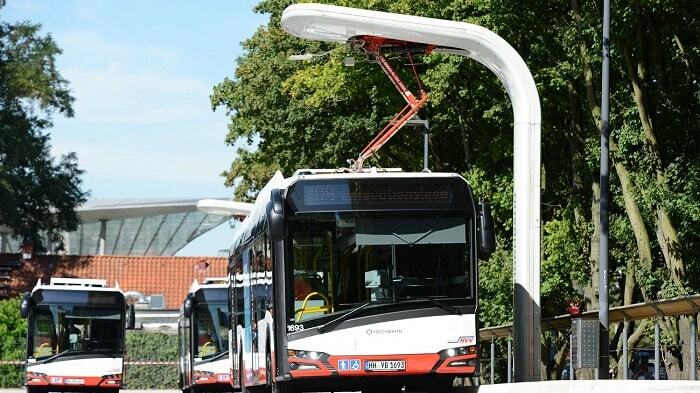 Allegedly, Siemens is the world’s first supplier of this flexible charging infrastructure for e-buses. Two charging stations are integrated into each of the two charging terminals with a capacity of 300 kW. Situated in the Bus-Port (ZOB) in downtown Hamburg and in Alsterdorf, a charging process takes about six minutes. Enough time for the fast charger to operate a full day with all-electric buses from terminal to terminal on Line 109. The charging system uses open international standards IEC 61851 and ISO 15118. It is possible to charge buses from several manufacturers with one charging station by applying this standard. The new all-electric buses from Solaris use an onboard charging system from Siemens. They have been specially developed for the quick-charge stations. To summarize, the onboard equipment and charging infrastructure provided by one supplier, Siemens, enables interoperability – integration of different all-electric buses and hybrid buses into one system. “Battery technology is becoming increasingly attractive for use in buses. The electric hybrid bus is an important further step for us on the way to procuring 100% electric buses. Hochbahn sees itself as industry’s partner in gathering important experience in everyday service,” said Ulrike Riedel, vice president for operation and human resources at public transport operator Hamburger Hochbahn, in a press release for presenting the new electric hybrid bus for Hamburg’s downtown district (dated 06 November 2014). End of 2014, Hamburg provided 239 public charging stations and is, therefore, a leader in electro-mobility. A network of 592 charging stations, including 70 fast DC-charger with a recharging time of 30 minutes, was planned until mid of 2016.